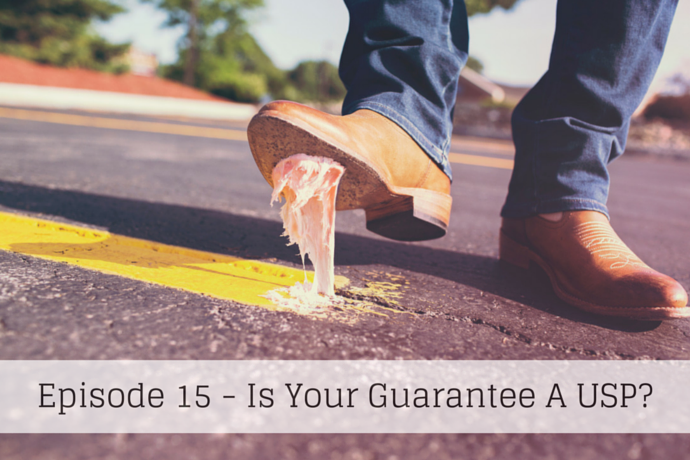 Is Your Guarantee a USP? Huh? I know what you’re thinking; “What is he talking about now?” But bear with me. USP by the way is Unique Selling Proposition or Unique Selling Point. Now, is your guarantee actually working for you, or is it just something you thought “Oh I need a guarantee so I’ll just write one”? There are good guarantees and there are bad guarantees, most guarantees I see are awful. They’re not actually guarantees that help the customer, they’re guarantees to help the company. Now you’re going to think – well it’s my company it’s our product, so of course we need guarantees to help us. If that’s what you think, you’re getting it all wrong. The customer is everything. You want customers. You want to remove obstacles. A bad guarantee is an obstacle, it’s a hindrance, it’s roadblock. It’s something that’s going to make them think twice about buying from you. Let me give you an example: You give a 3 day guarantee or a 7 day guarantee, if they don’t like the goods they can return them to you and you’ll give a full refund, less a restocking charge, within 28 days. Do I need to explain what’s wrong with that? But those are what we hide away in our terms. You may not even put it there, you may “well, it’s in the terms and conditions”. First of all, if the customer has bought something from you, and it’s wrong, it’s not correct, it’s not what they want, why can’t they return it? Just please, why not? What difference does it make? If it’s clothes, do you think they’ve worn it over the weekend, put the labels back on and bought back? Otherwise can it just be hung on back on the rack? What happens to the clothes in your store? When people try them on and pull all the pins and everything out the shirt and you have to put it back on the rack? What’s the difference, if it’s got the labels on, if they have the receipt? What difference does it make? The second thing is what difference does it make whether if it’s 7 days – 14 whatever? Me as an example: I fly to Vancouver. I’m away for 30 – 40 days at a time, so if I bought something, to take for a friend out there, and it was wrong, by the time I get back it’s over a month later, I haven’t used it or anything it’s just that I didn’t need it. I’m a genuine returnee. Why can’t I have my money back? Restocking charge? Give it a rest! Join the 21st century! All the rest of it, just stop making excuses, for any reason, and what about whether they’ve used it or not? Let me give you examples: Zappos.com are the perfect examples of the perfect guarantee. For those of you in the UK, if you don’t know Zappo’s it’s a shoe company and they were so successful, Amazon acquired them (although Amazon don’t use the brand in the UK). 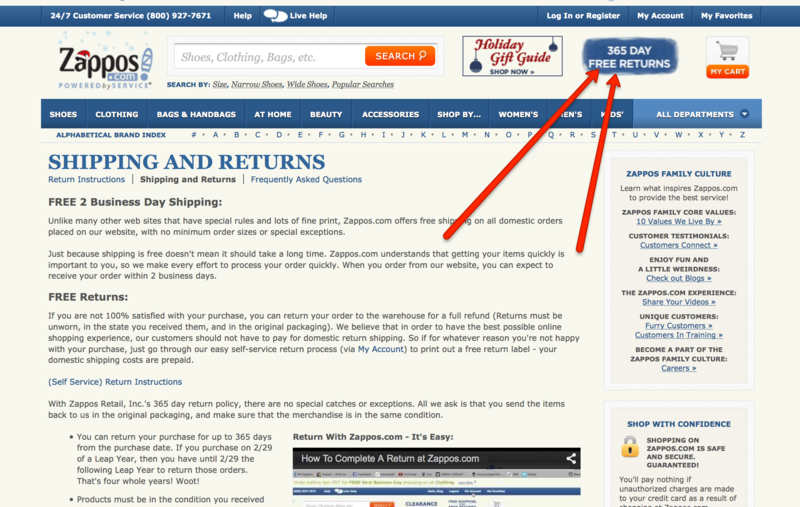 Amazon couldn’t outdo them, they had to buy them, but what Zappos offer is a 365-day guarantee. Those among you, the cynical ones are going to say “People are going to buy shoes, wear them for a year and send them back”. Are they? Are they really? Do you think Zappos built in to a multi-billion dollar company using that as the pure selling point, with that as the result? People just don’t. If you offer good service, and offer great things, people just don’t. Sure, there’s going to be someone somewhere along the lines but how many things do you sell? Can you not afford that one? Think about it. In my company, we sell fire extinguishers. It costs us a fortune to send them out, we give 90-day free returns, and that means we will pay to go fetch them. By the way, with returns you must pay to get them back, don’t tell the customers to send them back. Send them a returns label or send the courier to them to collect. Yes it would cost you more, but it’s part and parcel of doing business. Consider if you knocked something off the shelf in the stock room and it breaks, it goes in the bin, what happens? It’s just part and parcel of doing business. It’s a stock write off. But I seriously cannot think of the last time somebody, actually took the mickey and sent something back that they’ve used. We have had one, but even so we looked at it, and it was perfect, we could tell it had been used but we did not mention it to them, we gave all their money back. And we give the money immediately. Forget the 28 days. Amazon, I think I’m right in saying, give you the money back as soon as you tell them you are going to be returning something. Think about that! It works. These people don’t get big without it working. Look at Zappos.com, I recommend it. And that’s the Weekend Challenge. I want you to take a piece of paper I want you to write down your guarantee. If you don’t have one, come up with one. Look at Zappos, look at others, look at FireProtectionOnline.co.uk and see what works well. Google, “great guarantees”. Write one out, decide that’s going to be yours and put it in place. Your week end challenge, otherwise have yourself a great weekend I’ll see you soon. Today’s show, is sponsored by the wonderful people from Copyblogger and their Rainmaker platform.